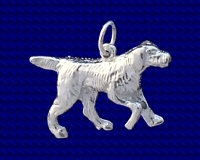 Sterling silver Pointer charm. Pointers are bred for their skill of pointing out the position of game birds to hunters. Its origin appears to go back to the 17th century. Craftsman made Sterling silver Pointer charm. Approx. size 15mm x 23mm.